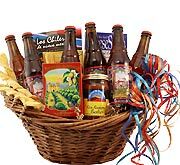 This is the perfect way to deliver something sweet and something salty all in one basket. From the first sip of the hoppy beverage to the last blast of salt from the pretzel bag, there is no better way to tell someone that you're thinking of them. I sent this to my 21 year old nephew to celebrate finishing his college finals. He loved it. His girlfriend stole the almonds and said that they were delicious! 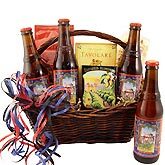 They both said that they would love another basket like this to try different beers. My dad loved the basket. 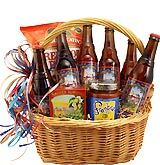 He couldn't wait to chill the beer and sit down and enjoy his birthday basket. Much appreciated by my FIL. So cool I can send him CO beer to FL when I live in New Zealand. The toffee pretzels are awesome! Great slection of savory and the beer companions. came in a pail instead of a basket which is actually better.